This (indicator) assistant gives out sound, information, push and Email of the notice at your choice at contact or approach of quotation of currency pair on graphics to standard levels of support, resistance or any other objects on graphics of which you chose. settings window in which you need to choose only types of notices – Email, Popup or Push. You can choose everything or only necessary for you. 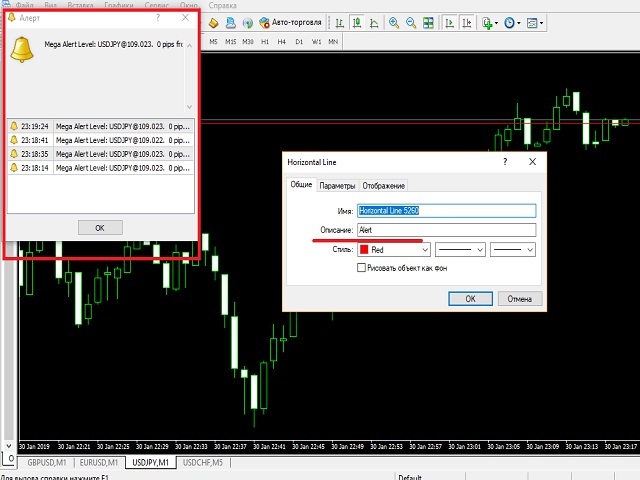 Consider if you want to receive Email or Push of the notice, they have to be correctly ready in settings of the MT4 terminal. The settings chosen by you will be reflected in the right top corner of the schedule. 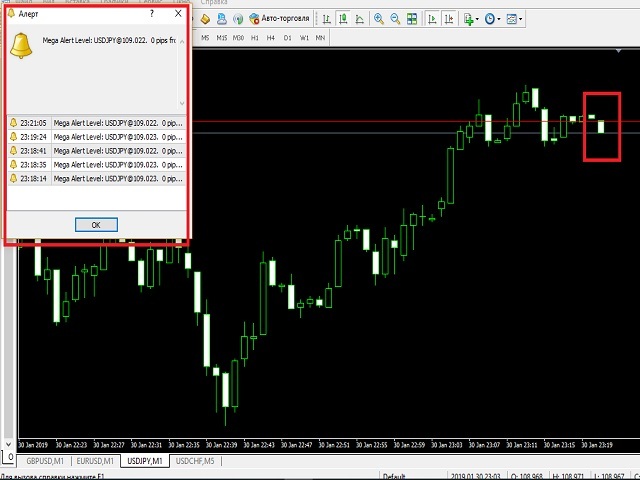 All this is Forex the Mega Alert Level indicator is ready and ready to work. 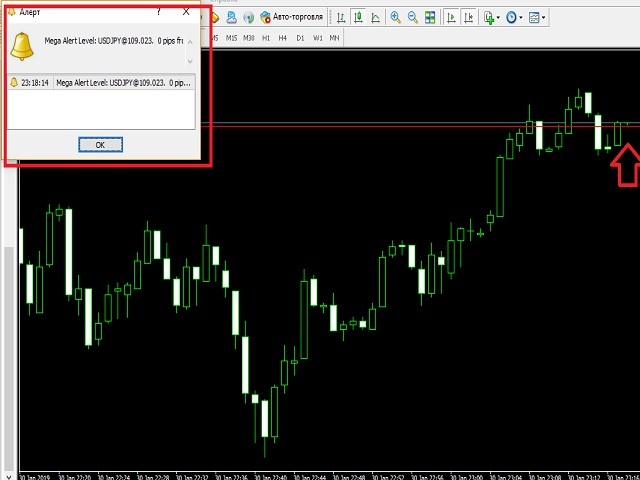 We allocate the line necessary to us on graphics, we right-click a mouse on it and we specify the command of the Alert_10 indicator in the description of the line if you write just Alert that it gives a signal when the quotation of a kosnets of the level. It is also team to our indicator a tax алерт at contact with the price of the chosen line. And, the figure after an underscore in the command of the indicator means quantity of pips from the set level when the signal has to sound. In other words, if our level (as on the picture) is established on value 0.97971, and the value of the Alert_10 indicator, then a signal will occur for 10 pips to level on value of the price 0.97961. 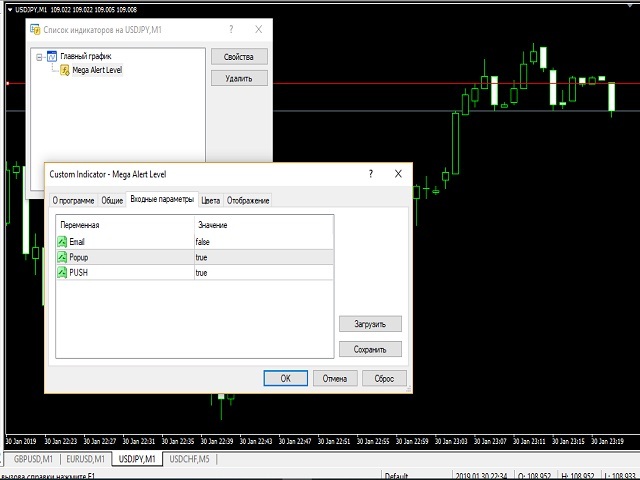 The algorithm of the indicator is adjusted in such a way that it just constantly compares the quotation of currency pair to the indicator parameters set by you in settings of level and gives a signal when these values coincide. As a result, you can adjust a signal as it is convenient to you. Consider the fact that at fast movements of the price in the market Forex, the terminal and the indicator need several seconds to create a signal and to send it to you.